"WOW!" 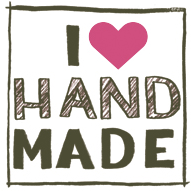 is all I can say after such an amazing turn out at the 19th Butterdome Christmas Craft Sale! There aren't many places in the world where you would you find thousands of people braving a foot of fresh snow and -28C to go shopping. Thank you to everyone who came out and supported my little hat company with their praise and purchases. Keep your eyes open for all those new Sugar Soul hats walking around town (especially those new toasty warm aviator hats!). If you missed me at the Butterdome, not to worry as there are at least 2 more chances to get a hat of your very own or for a gift. 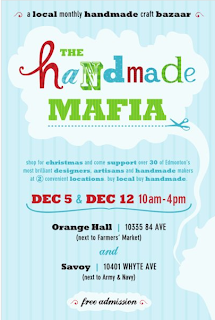 This Saturday, December 12th, you'll find me in the Orange Hall from 10am to 4pm for the Handmade Mafia. It is now FREE to get into and with its location right behind the Old Strathcona Farmers' Market, come on over after you have all of your veggies! 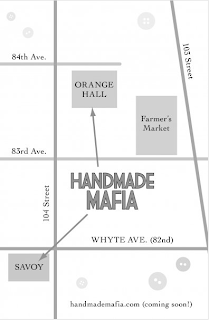 I will also be at the Handmade Mafia's Twilight Event on Thursday, Dec. 17th from 7-10pm at the Savoy on Whyte Avenue. Free entry, 18+, free candy canes and Christmas oranges (awesome! ).